Having just updated S2Member, it now seems when a member logs in, they’re taken to their WordPress profile page and not the Welcome Page in the Members Area. How can I fix this, please – it’s pretty urgent? This topic was modified 3 years, 11 months ago by Brian Bennis. I have it pointing to the ‘Welcome To The Members Area’ page from the drop down list, as it has been for months, but when someone logs in now, it goes to the profile page. A thought could be that a wordpress plugin or rule in your functions.php is overriding when a user logs in.? Clearing your chrome, or any other browsers cache shouldnt have an effect, what so ever, on how you have configured your s2member. Also, if you have not installed/updated any plugins that “takes over your login”, and you have not added anything to your functions.php, I dont know how you would proceed, except for creating a rule in your functions.php.. But that should not be necessary as S2member controls this. Perhaps you should wait for official support on this. I received the following error upon a review of your installation. I’m not aware of any reason for an older Member to be treated differently from a newer Member. The only thing that comes to mind is s2Member’s One-Time Offers (Upon Login), but those would have to configured by you, so you would know why this is occurring (i.e. it would be on purpose). It’s possible that you have a theme/plugin injecting a redirect_to value in your login page. Perhaps, ask if your host has backups? Jason, or anyone else for that matter cant sort out lost/overwritten SQL data..
Maybe you could check your SQL data via phpmyadmin or something, and go see if your old settings are in fact still there? If you use Teamviewer, I can help you out for 20-30 minutes, if you dont know how to do that. A small hint, Jason asked you to check if you had a conflicting login redirect. 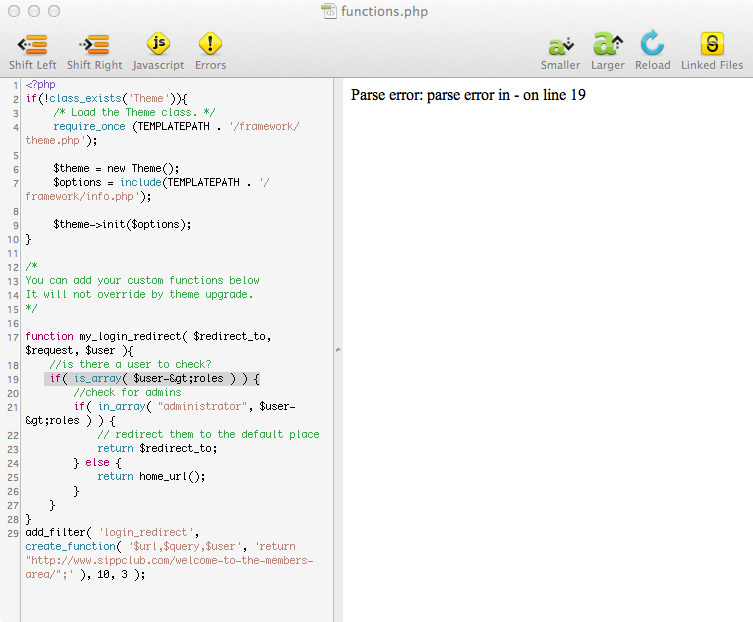 If you have this, it would be in your /themes/YOURTHEMEFOLDER/functions.php, not in the actual wp-login.php. This will make all who is member of the Administrator group go to the Dashboard, and everyone else is sent to google.com _after_ they log in. Of course, you would change that with the URL of the page you want them to go to.. Nonetheless, your S2member ->General Options ->Member Login Page should work for all logins with the execption like jason said. This reply was modified 3 years, 11 months ago by Ronnie.